9109 Unusual Arts and Crafts style clock. The brass plaque on the front reads: “Section of wooden water pipe laid down by the New River Company in the 17th century and unearthed in Fleet Street, London during excavations A. D. 1908.” I do not know any more than that about it except to say that is is not something homemade of amateur workmanship. This is a well made item with a factory Arts and Crafts hammered copper dial, raised numerals and arrow hands. I do not know what wood this is but obviously it must be something impermeable to water for it to be in such good condition after all those years in the ground. There are a few small losses to the outer bark area but the rest is clean and polished. If you enjoy the odd and unusual, then this might be for you. You certainly will be the only one on your block to own one. The movement is probably English because it is very well made with robust plates and bolted corner posts plus a heavy platform escapement. This is an eight-day timepiece (no strike) and it seems to be in good running order. 9110 Kundo 400 day clock. With an oval base and S curved legs supporting the movement, this is a little bit better than the average 400 day clock. The brass is in good condion without any dents or damages and it retains the original glass dome. The dial has a brushed silver look, is a signed Kundo and has applied brass studs for numerals giving it a modernist look. Perhaps it is from the 1960s era. 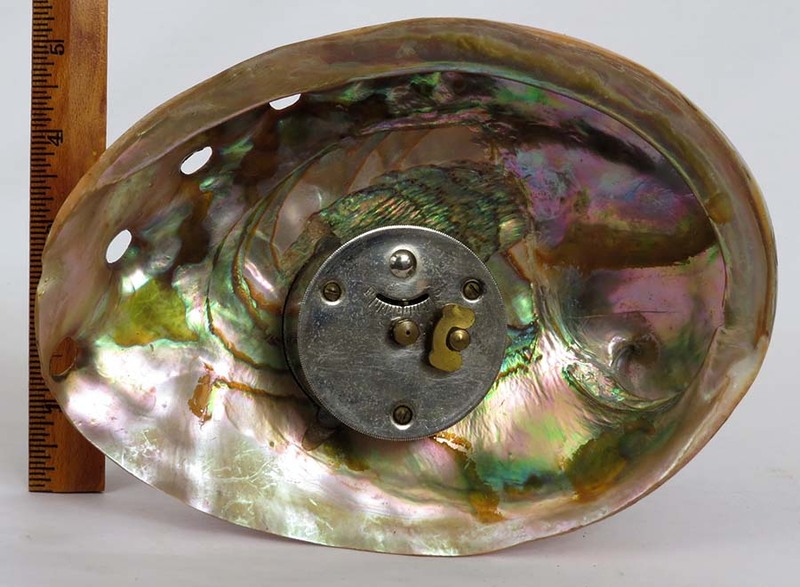 It has the original brass hands and four-ball style pendulum. The movement is signed “Kieninger & Obergfell, Made in Western Germany.” This clock runs 400 days on one winding but note it needs a new suspension spring. 8 ½ inches tall without the dome , 9 ½ inches wide. $85. 9111 Ingraham Maplewood desk clock. With that Art Deco look from the 1920s and 30s, this clock has a two-toned solid maple case with black highlights and a brass rim around the dial. The case is very clean and is without any chips or damages. It has an excellent signed dial with the typical Art Deco numerals and hands. I am quite sure this is a 30 hour timepiece. The escapement is fine and it ticks but does not stay running. The alarm works properly. 5 ½ inches tall. $45. 9112 Capital Clock Corp. N.Y. Art Deco desk clock. This clock has a wonderful Art Deco look having an engraved, silvered case with red glass inserts. The case could use a cleaning but it has no damages and all the glass pieces are intact. The silver colored dial has a stylized figure at the center with a pair of leaping dogs. True Art Deco numerals are around the outside edge with a pair of red hands at the center to match the glass inserts. I do not think this clock ever had any front glass therefore the dial does have numerous small scratches. It is missing that piece of folding curved wire on the back to serve as legs so it does not stand up on its own. Probably a 30 hour timepiece, it runs a short while for me and stops indicating that the escapement is okay but it is in need of a cleaning. 3 ¼ inches tall, 5 inches wide. $35. 9113 Clock, hygrometer and thermometer quartz desk set. This small desk set is in new, never used condition. It still has the original tag in place to keep the battery from running down before it is first started. The case is chrome plated with a mirrored finish. The central clock dial is signed “Breeze Collection.” The left dial is the hygrometer while the right dial is the thermometer. All three units are operating correctly. Battery included. Judging from the case and the style of the movement I would think this was a German-made clock but I could find no markings anywhere. The case is mahogany but note that it once had some type of a gallery or railing with turnings on the top as indicated by the empty holes that are there now. 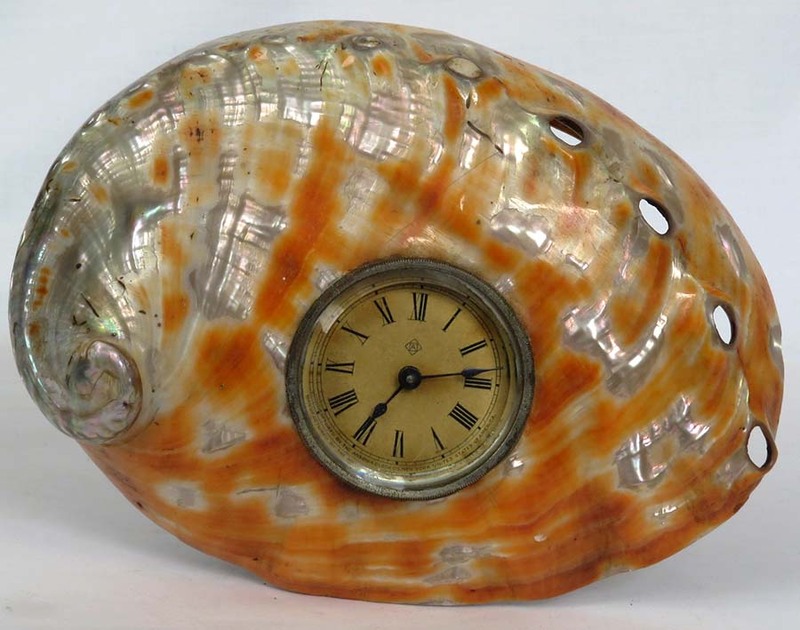 The dial is celluloid to resemble porcelain and it is in good condition. The hands are the originals. This is undoubtedly a one day timepiece with alarm. It has a balance movement, not pendulum and I could not get it to tick but the alarm does work. 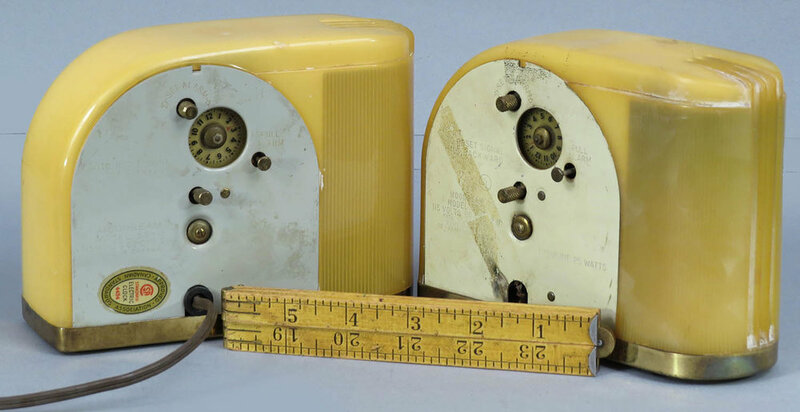 8056 A pair of vintage “Moonbeam” Deco electric alarm clocks. I have always liked and admired the Art Nouveau and Deco case styles when they are done well. These two have a pleasing case style which reminds you of the radios of the same vintage. They have Bakelite style cases with brass bases and are in pretty good condition showing a normal amount of wear from usage. Both dials are signed Westclox. One is from LaSalle, Illinois and the other is from the Western Clock Company United, Peterborough, Canada. Both dials are illuminated when running. One comes with a cord still attached. It hummed but did not run when I plugged it in. The other has an unattached cord. Both measure 6 ½ inches wide by 5 inches tall. I could not find this in the Ansonia catalog but I’m sure it must be a production clock not something made after market. The shell is in perfect shape without any chips or cracks. The dial is signed and has the Ansonia logo. It has a heavy beveled glass and the original hands. This is probably a one day timepiece but the mainspring is wound tight and I can not get it to tick.